What a hidden secret is Bristol. I had skirted through it on the Severn Bridge heading to Cornwall over a decade ago, but it was only last month when I discovered what a true delight it is. Blessed with beautiful weather, this time I got to see a vibrant cosmopolitan city that is being referred to in the UK as Little London, because it mirrors the energy and demographic of the capital city. I spent a weekend in Bristol courtesy of the team at Ireland West Airport, Visit Bristol, and Ryanair and discovered a wonderful weekend city that is so accessible from Ireland West Airport where fares to the city are unbelievably attractive. It was a short flight, well less than an hour. Barely had I the cuppa in my hand but they were going around with the refuse bags politely requesting it back. We stayed in the beautiful Brooks Guesthouse, part of a chain of wonderful boutique hotels and guesthouses. Brooks is also unusual because it has a series of Retro Rocket caravans on the rooftop. 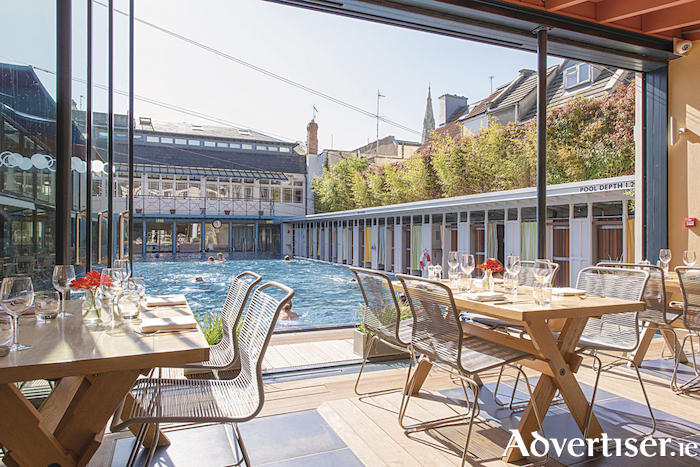 What an amazing way to stay and see Bristol, where you get immersed in the psyche of the city within minutes of your arrival in a cute hotel located right within a fresh food market. Within an hour we were getting another aspects of street art meeting commerce in the city, when our host Wendy Johnson of Visit Bristol brought us along the river to see Cargo, an area of retail units, restaurants, bars, all housed within repurposed shipping containers. What a sight — sleek, contemporary, and ideal for retailers of a certain size. How wonderful that would look in some parts of Galway’s maritime areas. After sampling about a dozen thimbles of various craft ciders and even some mead at the Cider Shop at Cargo, it was time for dinner at the Pi Shop, a lovely pizzeria serving simple, brilliantly cooked, wood fired sourdough pizza. This pizza parlour is a fond nod to Casamia’s original guise as an Italian trattoria dishing up traditional pizzas. It is, however, a very different beast - Pi Shop is uber-casual, for starters. It’s walk-in-friendly (in fact, it doesn’t take bookings at all ); the cheery staff are dressed casually; napkins and cutlery are stashed in wire pots on the tables for you to help yourself; and seating comes in the form of wooden benches and tables. So, yeah, don’t rock up expecting a Michelin-style feast here but as a veggie, I availed of the several veggie options available. Bristol’s nightlife too is gorgeously casual — with a wide range of outdoor eating, dining and drinking options, especially located around the King Street area where the five hundred-year-old pubs that inspired Daniel Defoe and Robert Louis Stevenson to write Robinson Crusoe and Treasure Island, are still open and serving ale to swarthy seamen and seamen. After a beautiful breakfast at Brooks, it was time to hit the streets again next morning for an open-top bus tour that brought us all the way to the beautiful Clifton village and a short walk to Brunel’s fantastic suspension bridge, which hangs 300 feet above the Avon Gorge. It is a spectacular construction, stretching across the river, dominating the city. Not surprisingly, it has also a sad history, and like the Golden Gate, has become known as a suicide bridge over the century and half since its construction. In 1885, a 22-year-old woman named Sarah Ann Henley survived a suicide attempt off the bridge when her billowing skirts acted as a parachute and she landed in the thick mud banks of the tidal River Avon at low tide; she subsequently lived into her eighties. Sadly though, the iconic landmark has been a scene of tragedy for hundreds of others who were not as fortunate. After that, it was time for us to sail upriver to see the SS Great Britain — the museum ship and former passenger steamship, which was the longest passenger ship in the world from 1845 to 1854. She was designed by Brunel for the Great Western Steamship Company’s transatlantic service between Bristol and New York. While other ships had been built of iron or equipped with a screw propeller, Great Britain was the first to combine these features in a large ocean-going ship. She was the first iron steamer to cross the Atlantic, which she did in 1845, in the time of 14 days. Our daring host Audrey Elliott, the marketing guru at Ireland West Airport and an accomplished mountain-loving adventurer, showed she had no fear of heights when she donned a harness and climbed up the masts of the ship, standing hundreds of feet over the dry dock where it now resides. Further example of the wide range of novel eateries that you can experience in Bristol was when we had coffee at the Ivy Clifton Brasserie, this ornate British-style cafe-bar where the arrival of morning scones and treats was fit for a king, which was appropriate given that we were there on the day of the royal wedding. Nearly everywhere we went marked the occasion with a twist of lemon and elderflower, even in the afternoon icecream we had at the delightful Scoop. We had lunch at the Clifton Lido — a restaurant located beside a year-round outdoor pool belonging to a private club. This was opened in 1850 and smacks of bygone days, and offers swim and eat packages (though not within short time of each other ). It is a splendid luxury in the heart of old Clifton village. For lovers of cocktails in bright or breezy locations or indeed, speakeasy locations, the evening was rounded off, after a wonderful dinner in the River Cottage Kitchen, with hanging with the bloggers in The Florist on Park Street and by discreetly getting the nod to get into Hyde and Co where you ring a bell and ask for special admission in the style of Boardwalk Empire and the days of Prohibition. Our last morning in Bristol was spent with street artist Duncan McKellar who brought us on an entertaining tour from Blackbeard to Banksy and showing the wondrous works that make Bristol the street art capital of the UK. Before we headed to the airport, we stopped for some smashing pies at Pieminster. Wow, were they delicious. You have to try them. We had packed quite a lot into just more than 48 hours. Add an additional few days and you can have a wonderful break away in Bristol in less time than it would take you to drive to Kinnegad. I firmly intend to return with the family later this summer. Flights to Bristol from Ireland West Airport are three times weekly all year round: Wednesdays, Fridays and Sundays. Fares as low as €12.73 one way are available at present with Ryanair. See www.ryanair.com for details, and also check out the wide range of destinations on http://www.irelandwestairport.com. For more information on how you can be wowed by beautiful Bristol, see https://visitbristol.co.uk.